Shaikh Khalid and Hammond at the groundbreaking ceremony. A groundbreaking ceremony was held at the end of October for a new British naval base in Bahrain that is expected to open next year. Named HMS Juffair, the base is a major overseas commitment for the UK, which aims to protect maritime interests and deter looming threats from the conflicts in Yemen, Syria and Iraq. 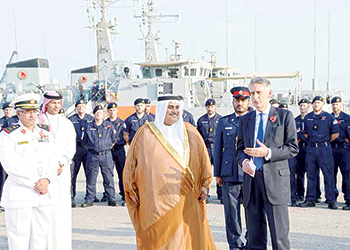 UK Foreign Secretary Phillip Hammond and his Bahraini counterpart Shaikh Khalid bin Ahmed Al Khalifa attended the ceremony for the new facility at Mina Salman Naval Base. An estimated £15 million ($22 million) will be spent on the new base, upgrading the facilities currently used by the four British minehunters working in the Gulf. Shaikh Khalid said it was yet “another milestone” in Bahrain and the UK’s historic relations. HMS Juffair will be located near the US Fifth Fleet Naval headquarters.